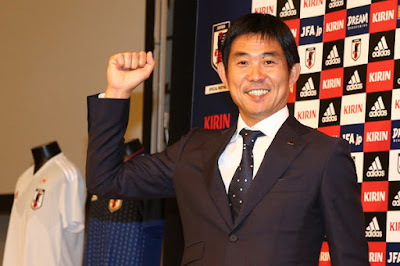 On the 26th July, Hajime Moriyasu was named the new coach of the Japan national side. The 49-year-old Moriyasu replaces Akira Nishino, who managed the country during the recent World Cup in Russia. The new head coach for Japan is 49-year-old Hajime Moriyasu who has previously managed the Japan Olympic side amongst other teams. Along with this, he's led Hanfrecce Hiroshima to J League titles in 2012, 2013 and 2015. Since Japan qualified for their first World Cup in 1998 they have employed a foreigner to manage the country at the start of every World Cup cycle. This means Moriyasu will be the first Japanese coach to be put in charge of the side four years before the next World Cup. This is clearly a huge honour for the man from Kakegawa, Japan as said at his press conference "As a manager, I cannot forget that I am now carrying the weight of representing Japan on my shoulders". Moriyasu already knows the team well as he was part of the coaching staff during the World Cup this summer. As part of the Olympic team to, he will know many of the players. It, however, remains unclear if he will stay in charge of the Olympic team for the 2020 Games in Tokyo. Hajime Moriyasu where to start? The first task for the new head coach will be to manage the country in the 2019 Asian Cup in the UAE. This will take place in January so he will have some time to prepare. It will be a great chance to bring early success to the national side as the coach. As the country has won the competition a record four times. Meanwhile, the national side has been drawn in Group F alongside Uzbekistan, Oman and Turkmenistan. Going into his first major tournament so early into his job as the national coach he will hope to improve on his record as a player. As a player, he picked up 35 caps for Japan during the 1990s, including missing out on the 1994 World Cup courtesy of a last-minute equaliser by Iraq.